Our Quick and Easy Fruit Sauce recipe gives you three variations, but the possibilities are endless. Just follow our simple steps and you'll have a fruity dessert sauce in minutes. 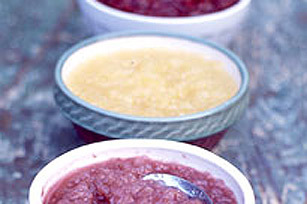 COMBINE in a bowl, 4 cups chopped and peeled fruit, 2/3 cup Kraft Jam, 2 tsp. lemon juice and 2 Tbsp. water. COVER and microwave on HIGH for 8 minutes. Let stand 5 minutes. Uncover, mash with fork.